Ideally, when planting out, choose a location sheltered by trees and shrubs. Most species of Cyclamen need shelter from the wind and driving rain and also shade in varying degrees – although Cyclamen Hederifolium is more forgiving in this respect than the other varieties, however, well-drained soil is essential ! in waterlogged conditions. A small amount of peat or leaf-mould may also be beneficial . After perhaps 3 years the corms will need to be at least 1 ft apart if grown as a block. Until then they may be planted closer if you wish and when they need to be more widely separated they should be transplanted in early summer, when dormant, to a more suitable spacing. 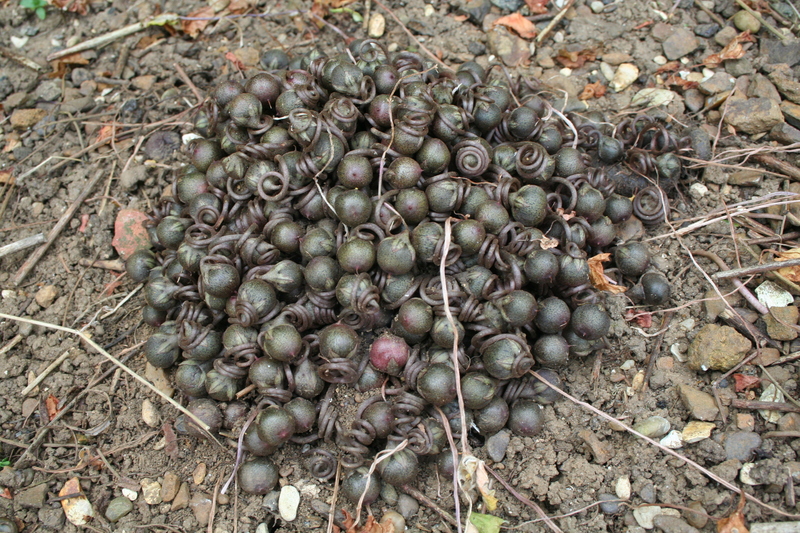 Plant Hederifolium so that the top of the corms are approximately ½” inch below the surface, covering all growth loosely except open leaves, open flowers and seed pods (which look like coiled springs and ripen and burst during the summer). During late spring/early summer most varieties are in dormancy and may not show any ‘top’ growth. 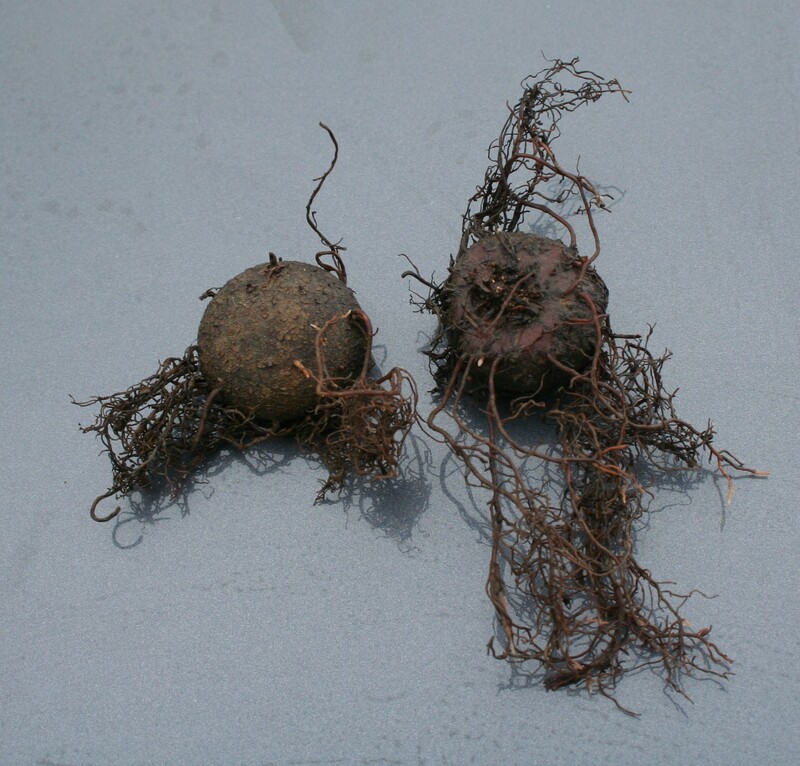 Care needs to be taken with Hederifolium at this stage due to the unusual pattern of root growth – you should plant the corm with smooth side DOWN and with the roots laid horizontally. In nature the entire genus originates from a large area centred on the Mediterranean. Although some may be found at sea level, most grow in mountainous regions, and can be treated as alpines. Due to their places of origin, cyclamen actually thrive under shrubs and trees where little else will grow because of the shady, dry summer conditions, which makes them a valuable addition for any garden with such ‘problem spots’. When established, Hederifolium will slowly spread by self-sowing. However, individual plants can live for more than 100 years, the corms becoming very large – you can expect ‘happy’ corms to reach ‘dinner plate’ size in about 10 years. The Hederifolium corm on the left is upside down – showing the smooth rootless underside which should be planted downwards. The Hederifolium corm on the right is the right way up. summer (July/August) These can be gathered when the pods go soft, and sown to produce flowering corms in about 3 years. will get nothing, so perhaps a better way is to let them self-sow and transplant as necessary. In this photograph, you can see a recently set flower having shed it’s petals and coiling down to start the formation of a seed pod. This Hederifolium corm is about 10 years old. due to ripen in July/August. that set seed, and each pod will contain at least 30 seeds ! please store them temporarily in a tray of soil or compost, covering the the top of the corms and all growth loosely – except open leaves, open flowers and seed pods – and keep damp. 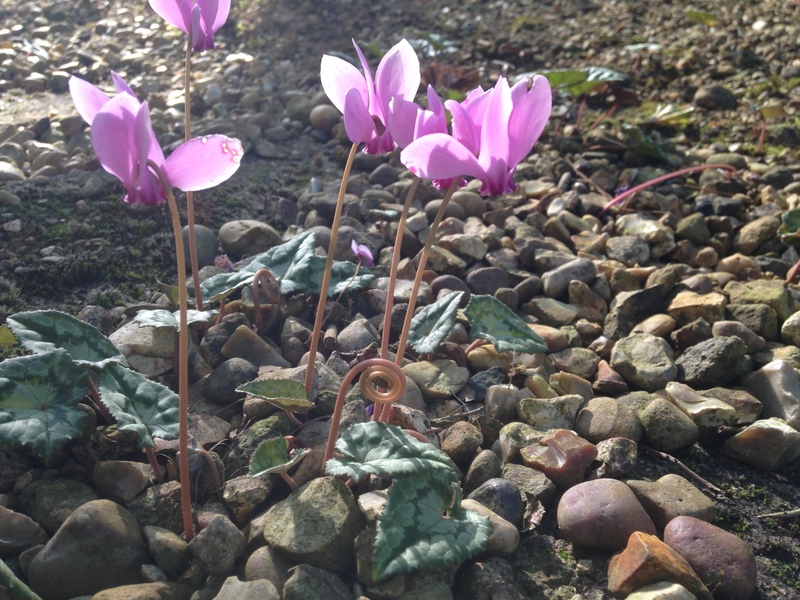 Finally – Our cyclamen are not grown quickly and may be smaller than others you have seen. Ours are hard and tough, (feel them! ), and are best prepared to survive the move.